Mobile friendly and timeless/modern designs. Personal web designer on each project. Can speak to them daily by phone if needed. We understand you are not a website expert. That's why we assign you a web designer who will walk you through our step-by-step process and customize the design of your website to fit your needs. This is how we make sure your association website is useful and professional. Through automation, our association management features are designed to help you focus more on your members and not on day-to-day tasks. Our software enables members to register, submit payments online, view invoices and check their account balance directly through the website. Our association features keep your members engaged and informed. Members learn about upcoming events and the latest announcements. Members discuss what's happening on the message board. Administrators can send reminders through mass emails and text messages. Association Management Software is designed to help social and professional organizations manage their administrative tasks and improve member satisfaction. Because the software a website based, members can manage their accounts, get information and submit items at any time and from any device. The core of the software is the data on each individual member. This information is used by administrators to track member details, transaction history and activity involvement. Members can also be allowed to update their own information. An administrator is notified via email each time a member changes their information. Members are automatically reminded when their membership with the association is coming up for renewal. An administrator uses our association management software to configure how many notices are sent and the schedule they are sent based on the number of day before and/or after the member's membership renewal date. This saves the administrator's time because they no longer need to manually track and remind members to renew their membership. The process for paying dues is also simplified. Members can visit the website and see a notice that displays the current amount they owe the association. This amount is automatically calculated by the website based on unpaid invoices, unapplied payments and open credit memos. Depending on your accounting settings, members can pay online and/or send a check. Let us show you how much better things will be with Membership Space's association management software. Take a tour and feel free to contact us with any questions. We have been creating software since 2001. During this time, we have seen many changes both in the needs of our clients and in the membership industry. Our association clients have also seen many changes from the perspective of their members. 15 years ago, members would mostly visit a website to get information. Today, members are looking for more online interaction and the ability to conduct business through the website. This is why we developed the ability for members to discuss items on the message board. Members can also see how much they owe, make a payment and view their transaction history directly through the website. Because each association is different, administrators can choose which features are enabled on their website and configure the settings for how our association management software works. Events can be set up with RSVP ability so that members can indicate if they are attending. Send messages directly to members' phones so that everybody has the latest information. For organizations with master and sub associations, members can be assigned to a chapter. Members can be sent email messages that are customized with details from their profile. The profile details of each member can be listed in the online directory along with photos. 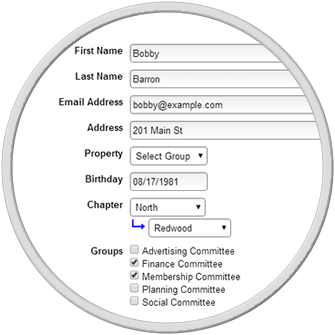 Add custom fields to profiles so that the necessary information is stored for each member. Each member can view their current account balance along with their historical transactions. A variety of financial reports are available including the Income Statement and Balance Sheet. Invoices, payments, refunds, credit memos, deposits, dues and even products are all covered. There is no need for an app to be created nor a separate website for visitors using a mobile device. 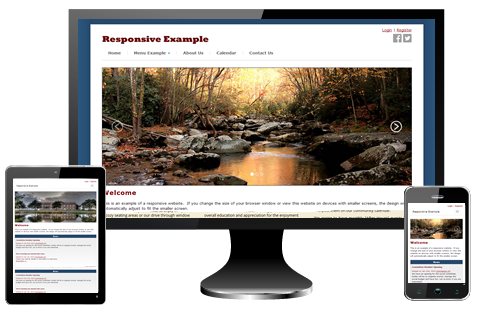 We are able to create a single website that automatically resizes and optimizes based on the visitor's screen size. This gives you a cost savings and gives members a uniform experience that custom fits on desktops, phones and tablets. After having a terrible experience with another website provider, this was such a pleasure! Development of the website with their tools was so easy and our web designer was always so quick to get back to us and so helpful. He explained everything thoroughly and in user friendly terms. I would highly recommend! I am amazed at how quickly my website came together! I thought it would take about a month, but it was up and running within a week. And it was so easy, especially with the step-by-step process. I highly recommend this website service to any membership association wanting a professionally designed website. We are very happy with Membership Space. The service we received from our web designer was impressive and the flexibility and tool-set of the site is very easy to use and productive. I strongly recommend them to any association looking to develop a website for themselves. Thanks once more for working with me on our new site. You are always very easy to work with and quick to respond. I am already getting very positive feedback on it already and I know the members will enjoy the new features. I don’t have any more sites up my sleeve but you never know! You are a joy to work with. You work fast and efficient and helped us get exactly what we wanted faster than we thought possible. Our Golf Association is thrilled with the new website. I love the detailed instructions and knowledgebase. Your staff were very responsive and I often received immediate replies to my emails. We are now live and everything is running smoothly. Thanks for a great product at an affordable price. This is the 4th site we have done and it has become the defacto standard for our association websites. Owners and Boards love the website. Thanks for making this easy for us non-tecky folks to manage websites. This is the second time I've used Membership Space. I was so impressed with how easy it was and how they helped me through the entire process that I decided to use them again to build a site for the swim and tennis club in my neighborhood. They make building and maintaining websites a breeze! Many kudos and much appreciation to your team for getting our website up and running under a tight time frame. We will definitely be saving money and getting much better customer service than we had in the past. I wanted a beautiful design that would complement our beautiful coaches and Membership Space fit the bill. I have had nothing but positive feedback from our members as to the ease of navigating to various parts of the website. My web designer was more than patient with me – he was an absolute saint! Ready on our pool table. Wake us up each month. Glow in our conference table. What Happens At Membership Space? Our days are often like any other. We're answering questions, listening to feedback, creating documentation and developing the next super idea. By having our entire team under one roof and developing all of our software in-house, we are able to provide our clients a membership software solution that specifically targets the needs of associations and give our clients fast support when they need help. In 2005, we shifted our focus to creating meaningful websites that solve problems within associations. This led us to developing software that automates processes and improves documentation. To increase the satisfaction of association members, we wanted to help members interact with other members and easily use the website regardless of their technical knowledge. With feedback from our clients, we continue to develop our membership software with these concepts in mind. How can you help association members feel like members? Members will more likely be involved if you keep them thinking about the happenings within your association. This is why we developed features such as the calendar so that administrators can keep everybody informed about upcoming events. 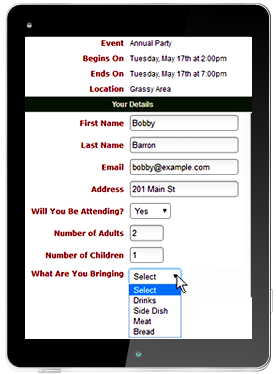 Individual events can also use our RSVP feature, which allows members to indicate if they are or are not attending a particular event. Custom questions can be added to the RSVP form to collect important information. Our News Articles feature is another frequently used feature on association websites. An administrator can post announcements with text, photos and links. Each article is automatically archived based on the month and year it was added to the website. This helps members reference previous articles. An administrator can also enable comments for each article so that members can share their thoughts. Features such as these in our association management software help members become more engaged and feel more like members. However, if members do not visit the website this information will not be seen. This is why we developed communication features. Administrators can send mass emails and mass text messages to remind members to visit the website for the latest information. We have also found that if we help administrators perform their duties more efficiently, the satisfaction of the association's members increases as well. Administrators can spend a lot of time managing members' membership renewals, payments and account balance questions. We have automated these processes by enabling member self-service through the website. The website will automatically send customized messages to each member when their membership is coming up for renewal and past due. Members can then pay their outstanding balance through the website. Payments automatically mark the paid invoices as closed and the appropriate accounting entries are made. Members can also view their transaction history along with the details of their open invoices. Our software automation helps associations spend less time on administration and more time helping their members. Take a tour of our website and check out all of our association management software features. We specifically designed our support and software around the needs of associations. Also, let us know if you have questions. Since 2001, we have been helping association leaders more efficiently manage their day-to-day responsibilities and increase member satisfaction. Our association management software automates common tasks and gives associations the tools, reporting and support they need.